The hot summer days that most of us enjoy after winter have not been so enjoyable for residents of Snake Park in Soweto in the past. Instead, it brought misery to them, said 61-year old Rebecca Shingange. They did not have flushing toilets, which was especially difficult in summer. “Summer meant having to stomach an unbearable smell, and fighting flies all day and night,” she said. But true to government’s commitment to improve people’s lives by removing the bucket system in all informal settlements, Snake Park residents are now among those who have flushing toilets. “My life has changed for the better and I’m very happy. I am living well now, because I don’t have to worry about my health and that of my children anymore,” Shingange said. But waiting for flushing toilets has been hell for them, she said. There was always the fear of getting sick because of the unclean conditions. The toilets used to get blocked all the time and water containing the waste material would flood the streets. It was a nightmare living like that,” she said. Some communities do not share in Shingange’s joy yet, especially in the Free State, North West, Northern Cape and Western Cape, but their turn will come. Under government’s bucket eradication programme all communities still using the bucket system will soon also have flushing toilets. In a joint effort, the departments of Water Affairs and Forestry, Provincial and Local Government, Housing and the South African Local Government Association (SALGA) have vowed to end the use of the bucket system. 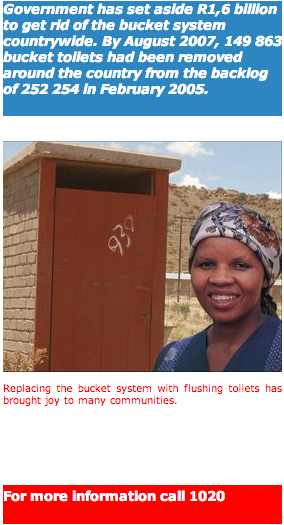 Government has promised that new houses in formal settlements will not be built without proper flushing toilets. Furthermore, bucket system toilets in residential areas started after 1994 will all be replaced through the Sanitation Programme by 2010. 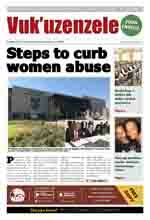 In informal settlements the sanitation problems will be resolved through the National Housing Programme by 2014. Both these government programmes will ensure that the joy expressed by Shingange, whose life had been changed for the better, will spread to every corner of the country to improve the lives of ordinary South Africans.